Nothing enhances a property’s aesthetic value more than a decorative wrought iron fence. However, like anything else in and around your home, they do need regular maintenance. Salt water, high rainfall and general weather wear and tear can sometimes wreak havoc on wrought iron pieces, but taking good care of your fence will not only enhance your property’s attractiveness, protecting it is also a great financial investment! Here are some of our expert tips to caring for your wrought iron fence. Wrought iron fences are prone to rust when they are exposed to elements like rain, humidity and salt water, so it’s important to take steps to prevent damage if you can. There is a range of protective sealants and preventative paints out there, many of them with superior anti-corrosive properties that will extend the life of your wrought iron fence. Plus they’ll ensure your fence is looking great – 365 days of the year! Extra diligence may be needed in caring for your wrought iron fence if you live in a high rainfall area or in a coastal location. Saltwater in particular can speed up the corrosion process, so ongoing maintenance (like regularly oiling hinges so they don’t seize up) is always a wise move. When maintaining wrought iron, it’s important to check your fence regularly, and look for cracks, signs of rust, chips in paintwork and other damage that could affect both its performance and the security of your property. If noticed sooner rather than later, most wrought iron fence problems can easily be alleviated and/or repaired. 1. Use a soft brush (or a toothbrush to reach hard-to-reach areas) to eradicate any dirt, dust and debris once or twice a month, and if your wrought iron fence has lots of decorative scrollwork, be sure to pay attention to crevices where it’s easier for debris to gather. 2. Don a pair of rubber gloves, fill a bucket with soap, mild detergent or a gentle household cleaner mixed with warm water (not hot! ), and use a non-abrasive cloth to clean your fence. Avoid squeezing out too much excess water as you’ll need plenty of soapy suds to clean it effectively. 3. Avoid antibacterial soaps or cleansers that contain bleach as they may damage the wrought iron. If using soap, add 1 tablespoon of soap to around 950mL of water. If using a household cleaner, add ¼ cup to around 1900mL of water. 4. Never use any harsh cleaning materials on your wrought iron fence, as things like window sprays and polishes can lead to staining. 5. Remove dirt and dust by wiping in a circular motion, and work on small sections at a time until it’s fully clean. You’ll probably need to re-wet the cloth consistently to do the job properly. 6. Use a hose to rinse thoroughly with water. 7. Even though metals are pretty hardy substances, chemicals in water can sometimes leave residue that can damage or stain wrought iron, so always dry with a lint-free cloth. Then let your fencing dry completely in the sun. Immediately after cleaning, if you’ve noticed rust on your wrought iron fence, file it down gently with sandpaper, a piece of steel wool or a coarse wire brush. Brush away the excess flaxes and then re-clean it by following steps 1 to 7 above to ensure any remaining remnants are removed. When caring for wrought iron, applying a rustproof primer and painting your fence can help protect it from damage as paint creates a barrier between the iron and the air, minimizing oxidation and reducing the likelihood that rust will develop. Coat all surfaces evenly with primer and then apply an oil-based or acrylic latex paint that is specifically made for outdoor metal items, which will ensure your wrought iron fence has the ultimate protection it needs from the elements. Paint it once, allow it to dry thoroughly and then apply a second coat. If you are spray painting, make sure you have adequate ventilation and you use a drop cloth to prevent paint staining any other surfaces. Painting may reduce the risk of maintenance issues in the future, and if you apply multiple coats, you’ll ensure the most uniform coverage and the greatest chance of longevity of your application. Plus there’s nothing like a fresh coat of paint to enhance the beauty of a wrought iron fence! Touching up your fence’s paint job is a great tip for wrought iron fence maintenance, however, if there are large areas of oxidation, consider a hiring a professional to do the job for you. Keen to add a bespoke piece that will enhance your wrought iron fencing? Contact the experts at Dean-Wilson Iron on 3814 0076. 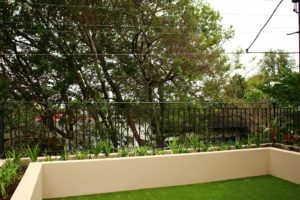 Previous Post The History Of Ironwork In AustraliaNext Post Backyard Fencing For Dogs – What’s My Best Option?